The central question presented in this appeal is whether Florida’s cap on noneconomic medical malpractice damages, Fla. Stat. § 766.118, violates the Florida or United States Constitutions. The Estate of Michelle McCall, Ms. McCall’s parents, and the father of Ms. McCall’s son (collectively “Plaintiffs”) also appeal the District Court’s application of that statutory cap. After thorough review and having had the benefit of oral argument, we conclude that the District Court did not err in applying the cap. We also conclude that Florida’s statutory cap passes muster under the Equal Protection Clause of the Fourteenth Amendment and the Takings Clause of the Fifth Amendment of the United States Constitution as well as the Takings Clause of Article X, § 6(a) of the Florida Constitution. Because no Florida Supreme Court decisions provide controlling guidance to resolve Plaintiffs’ other challenges to this cap on noneconomic medical malpractice damages under that state’s Constitution, we grant, in part, Plaintiffs’ motion to certify questions to the Florida Supreme Court. Does the statutory cap on noneconomic damages, Fla. Stat. § 766.118, violate the right to equal protection under Article I, Section 2 of the Florida Constitution? Does the statutory cap on noneconomic damages, Fla. Stat. § 766.118, violate the right of access to the courts under Article I, Section 21 of the Florida Constitution? Does the statutory cap on noneconomic damages, Fla. Stat. § 766.118, violate the right to trial by jury under Article I, Section 22 of the Florida Constitution? Does the statutory cap on noneconomic damages, Fla. Stat. § 766.118, violate the separation of powers guaranteed by Article II, Section 3 and Article V, Section 1 of the Florida Constitution? 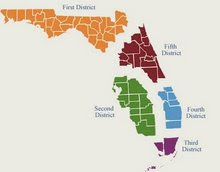 We affirm the district court’s application of Florida’s statutory cap on noneconomic damages. We also conclude that the cap comports with the Equal Protection and Takings Clauses of the United States Constitution. We conclude that the statute does not constitute a taking in violation of the Takings Clause of the Florida Constitution, and we grant Plaintiff’s motion to certify questions regarding Plaintiffs’ remaining challenges to the cap under state constitutional law to the Florida Supreme Court. Appellant challenges the judgment awarding attorney's fees and costs to Appellee, pursuant to section 627.428, Florida Statutes (2006), after Appellant voluntarily dismissed (without prejudice) its action for unpaid premiums. Because the voluntary dismissal was neither a judgment nor the functional equivalent of a confession of judgment - a precondition to an award under section 627.428 - we reverse. In Drucker, et al v. Duvall (4D10-4443), the Fourth District reversed the trial court's order denying a motion to transfer venue. Appellants filed the affidavit of appellant Jonathan Drucker, who averred that appellee executed the engagement agreement in Miami-Dade County, that all transfers into and out of appellants’ trust account occurred in Miami-Dade County, and that the settlement negotiations occurred outside of Palm Beach County. Appellee responded with legal arguments but offered no affidavits or evidence to support her claim that venue was proper in Palm Beach County. The parties here agree that appellants reside or maintain their principal place of business in Miami-Dade County. Likewise, the parties agree that this dispute does not involve real “property in litigation” that could serve as a basis for venue....The allegedly wrongful act of withholding appellee’s money occurred at appellants’ offices in Miami-Dade County, where all funds were received and distributed. Pursuant to section 47.011, Florida Statutes, venue is proper “only in the county where the defendant resides, where the cause of action accrued, or where the property in litigation is located." “It is the plaintiff’s option to select venue in the first instance, and ‘when that choice is one of the three statutory alternatives, it will be honored.’....The plaintiff bears the initial burden of alleging facts in the complaint sufficient to demonstrate that the action was filed in the proper venue....When a defendant challenges the plaintiff’s chosen venue “by filing an affidavit controverting the plaintiff’s venue allegations, the burden shifts to the plaintiff to establish the propriety of the venue selection. Because there was no connection to Palm Beach County, the Fourth District reversed the trial court's order with instructions that the venue be transferred. In Nudel v. Flagstar Bank, FSB (4D10-3001), the Fourth District held "that a defendant is entitled to recover her attorney’s fees as a prevailing party under subsection 57.105(7), Florida Statutes (2009), after the court granted a motion to dismiss a mortgage foreclosure action and dismissed the case without prejudice." Initially, we hold Nudel did not waive her entitlement to attorney’s fees. It was proper for her to seek attorney’s fees in a motion filed after the entry of the dismissal without prejudice, because she had not yet filed a responsive pleading....Because a motion to dismiss is not a pleading, Stockman does not require the movant to raise the attorney’s fee claim in the motion; rather, “a defendant’s claim for attorney fees is to be made either in the defendant’s motion to dismiss or by a separate motion which must be filed within thirty days following a dismissal of the action. If the claim is not made within this time period, the claim is waived.”...Nudel timely moved for attorney’s fees within thirty days of the dismissal, so she did not waive her claim. Therefore, the Appellant was entitled to recover her prevailing party attorney fees pursuant to her motion for attorneys fees which was based upon the fee provision in her mortgage. In Silva v. BAC Home Loans Servicing, L.P. (5D10-3511), the Fifth District reversed an order denying a motion to set aside a default judgment. In this case, the plaintiff served the defendant under section 48.031, Florida Statutes, by serving “Luz Rodriguez,” who was purportedly living at the property. After judgment was entered, the appellant/defendant sought to vacate the judgment and filed affidavits establishing they did not know Luz Rodriguez, that the property had been vacant for "some time" before the purported substituted service, and that they had lived in Miami for at least 18 months. The party seeking to invoke the court’s jurisdiction has the burden to prove the validity of service of process. See Torres v. Arnco Constr., Inc., 867 So. 2d 583, 587 (Fla. 5th DCA 2004). This record does not reflect competent evidence that BAC Home Loans Servicing L.P., the plaintiff below, met that burden. The default judgment was, therefore, void and must be set aside. See Alvarez v. State Farm Mut. Auto. Ins. Co., 635 So. 2d 131 (Fla. 3d DCA 1994). For what it's worth, the appellee did not appear in this appeal. In Jade Winds Association, Inc. v. Citibank, N.A. (3D11-275), the Third District reversed an order entered by the trial court canceling a foreclosure sale. After a foreclosure complaint was filed, a condominium association filed a cross-claim against the debtor for unpaid assessments. A default judgment was entered on the cross-claim and Jade Winds took title to the property. Jade Winds the filed a "Waiver of Public Sale" and Jade Winds also sought summary judgment in favor of Citibank. A summary judgment was entered and a foreclosure sale was scheduled. On the morning of the foreclosure sale, the bank filed an emergency motion to cancel the foreclosure sale allegedly based upon instruction from the client (bank) to cancel the sale to determine if the borrower qualified for a loan modification. The Third District said the basis for canceling the sale, to explore loan modification, "obviously was misleading" since the borrower no longer owned the property. Further, Jade Winds was not served with the motion to cancel the sale. Therefore, the motion to cancel was heard on an ex parte basis and was granted. The Court then referred Citibank's counsel to the applicable Miami-Dade administrative order (10-E), In re Amendments to the Florida Rules of Civil Procedure, 44 So. 3d 555, 557-58 (Fla. 2010), and reversed the order canceling the foreclosure sale with instructions to consider whether sanctions should be imposed.